vooya is fast. Even if nobody expects real time playback for raw video content coming from disk, 1080p@60fps or 4k@30fps without buffering should be quite impressive and facilitates the workflow. Note however that raw video is not really the format for live playback, because of the amount of data and disk speed. If you plan something larger, you better go and encode in AVC Intra or so. Hey, codec developer! OpenEXR and DPX/CINEON are, like TIFF, image formats that are often used in film industry. They are able to contain high bit depths or even floating point data and are lossless, that is why they are used before encoding for the end-user. HEVC, CTU depth, partition index, wtf? Hey, film industry guy! vooya was originally intended for being a tool for programmers in codec development. HEVC as the upcoming standard for video encoding organizes an image into (among others) coding tree units (CTUs) and partition indices, and these can be displayed nicely in vooya's magnifier; also the grid overlay is codec developer's friend. Always welcome. But vooya is a spare-time project, so everything is done on weekends and evenings, and because of personal interest. vooya is a desktop player, bound to the OS' output bit depth and color space, which until now is always 8bit RGB(A). The primary design goal of vooya was to convert any format (e.g. higher bit depths) into the desktop format to make it playable. Only recently, Apple has come up with a 10bit P3 display, and Windows/Linux can use dedicated graphic cards like NVidia or BlackMagic to give input to high-fidelity displays. vooya offers a plugin API, where you can use the native callback to drive sidechain output, e.g. pushing it to a Blackmagic Card. Everything beyond this may or may not come in future. 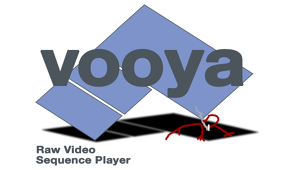 vooya is a raw sequence player for film industry guys and video software developers. Normally, they do not have audio at hand when they are using vooya and would be frightened if their video had sound, suddenly. Furthermore, it is unlikely to get raw video in sync with audio, and dropping frames is not an option for a frame-exact player. macOS - App Store or not? The version on Apple's App Store is essentially the same, but it has a sandbox entitlement. So if you are not confident, take that one, click a little more often and don't trust the command line interface. Oh, your company blocks download from our update server? Contact here, you will get the installer if you have a license. How are PSNR, MSE and SSIM calculated? On the original data according to http://en.wikipedia.org/wiki/Peak_signal-to-noise_ratio, SSIM calculation follows the proposals in the publication of Zhou Wang et al., with non-overlapping 8x8 windows and 8x8 Gaussian filtering @1.5 standard deviation. Yes, vooya can play file sequences like foo_00.jpg, foo_01.jpg, foo_02.jpg … It works for all image formats and as well for raw sequences (foo_00.yuv, foo_01.yuv, foo_02.yuv …). The last digits in the file name need to be numbers increasing by 1. Yes, even a full version on Linux, preferably in a VM. That version has the same features as the ones for OS X and Windows, yet the latter ones may be a little more supported and faster. If you really need a demo version for Windows/OSX, please contact me. The license permits to use vooya on multiple machines, given that only users authorized by the license (quantity) use vooya simultaneously. That is, you are free to install your version on a dev machine or VM, but your colleague needs another one. The license is perpetual and entitles for free updates on the version purchased, if any. Read the licenses for Windows/Mac, Mac (App Store) and Linux. Win and Mac sold separately? Some non-programmers might wonder why they have to purchase different licenses for Windows and Mac. See it the other way: They are ~30% different software, and then the price is so low … if it was single license only, vooya would cost twice as much. Yes! — press ⌘-Ctrl-Shift-4 to mark the rectangle, paste it somewhere with ⌘-V. Or, press ⌘-Shift-4 to save it to the Desktop as PNG. Oh, not on macOS? Go get yourself a decent OS. (Windows 7 has some sort of Snipping Tool). vooya tries to display every supported format reasonably. Which doesn't mean that color exactness is a goal, like your desktop monitor probably isn't color-exact either. Under some circumstances, flexibility (vooya supports a wide range of packings, arrangements and color formats) wins over precision of calculations.